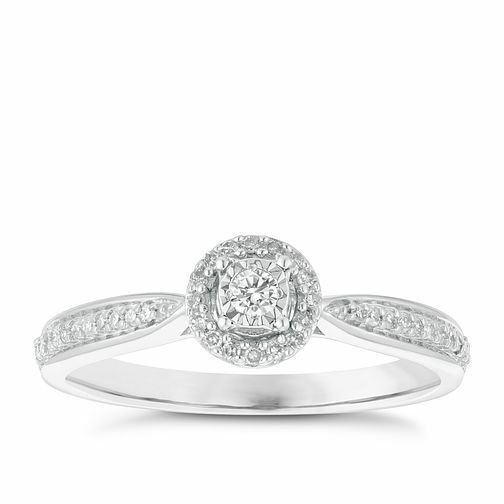 Stunningly simple design combines with perfect sparkle with this diamond solitaire ring. With round cut diamonds totalling 0.15 carat in weight in an elegant halo design with diamond set shoulders, this 9 carat white gold ring exudes exquisite class and style - whilst lighting up any outfit and any room. 9ct White Gold 0.15ct Diamond Solitaire Halo Ring is rated 5.0 out of 5 by 1. Rated 5 out of 5 by Anonymous from Fantastic ring and price was amazing Future wife loves the ring and we needed to have it re-sized which was super easy with very helpful staff at the Kingston branch. The best part was that getting the ring re-sized was covered under the guarantee so no added charges and we got it back 2 weeks earlier than originally indicated, amazing! Thank you for the great service and lovely product!